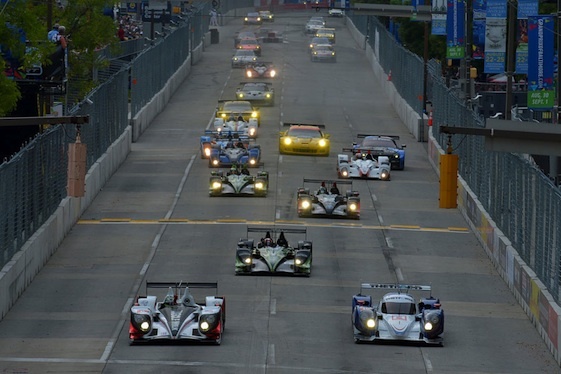 The Pickett Racing HPD ARX-03c leads the field in Baltimore. Klaus Graf and Lucas Luhr combined to clinch their second consecutive – and the final – American Le Mans Series presented by Tequila Patrón P1 championship with a victory in the Grand Prix of Baltimore presented by SRT, their sixth consecutive victory from the 2013 season. Clinching the title means that the Graf/Luhr combo will go down as the final ALMS champions as the series will merge with Grand-Am Rolex Series to form the Unified SportsCar Racing Series next season. The race was shortened to one hour, 13 minutes after a multi-car incident completely blocked the front straight of the Inner Harbor street circuit seconds after the initial waving of the green flag. It was the shortest race in ALMS history, with Graf and Luhr leading four times for 17 of the 41 laps in the No. 6 Muscle Milk Pickett Racing HPD ARX-03c. The race featured eight lead changes among five different cars representing three classes. Luhr took the lead for good by passing Guy Smith in the Turn 3 hairpin with 13 minutes remaining and then beat Smith to the checkered flag by 3.867 seconds. Smith led briefly down the stretch in the No. 16 Mazda/Thetford/Norcold Lola B12/60 started by Chris Dyson. “We’ve struggled here in the past, but today was our day to win the race and win the championship,” Luhr said after extending his ALMS-leading victory total to 48 with three races remaining this season. Jan Magnussen made a third-to-first move to take the GT lead shortly after the final restart, and held off teammate Tommy Milner by .457 seconds in a 1-2 finish for Corvette Racing. Magnussen and Antonio Garcia won their second race of the season in the No. 3 Compuware ZR1, over the No. 4 entry of Milner and Oliver Gavin. Dirk Mueller was leading on the restart following the third caution in the No. 55 Team RLL Crowne Plaza BMW Z4 GTE, with Magnussen passing both Milner and Mueller to take the lead. Marino Franchitti took his fourth P2 victory of the season in the No. 552 Siemens/Alpina Watches/Ohiya Casino Resort HPD ARX-03b, joined by new Level 5 Motorsports teammate Guy Cosmo. The victory gave Franchitti the lead in the PC class championship standings. Tristan Nunez went from third to first in the closing minutes to win in Prototype Challenge presented by Continental Tire (PC) in the No. 18 VisitFlorida.com/Ric Man/Signature ORECA FLM09. Colin Braun dominated the class in the No. 05 CORE autosport ORECA started by Jonathan Bennett before pitting with seven minutes remaining. That gave the lead to Dane Cameron, co-driver with Mike Guasch in the No. 52 PR1 Mathiasen Motorsports Molecule ORECA. Cameron broke with two laps remaining, giving the lead and victory to Nunez. In GTC, Dion von Moltke and Seth Neiman led most of the way in the No. 44 PR Newswire/eSilicon Porsche 911 GT3 Cup. Second, only .843 seconds behind, was Jeroen Bleekemolen in the No. 22 WeatherTech Porsche started by Cooper MacNeil. A multi-car incident at the start eliminated five cars and brought out an immediate red flag. Scott Tucker, starting third in the No. 551 Level 5 Motorsports Siemens/Alpina Watches/Ohiya Casino Resort HPD ARX-03b, was hit from behind by Anthony Lazzaro’s No. 01 Tequila Patrón HPD ARX-03b entering the front straight moments after the start. Tucker spun, while Tom Kimber-Smith – attempting to slow down in the No. 06 CORE autosport Composite Resources ORECA FLM09 – was tagged from behind by Wolf Henzler in the two-time winning No. 17 Team Falken Tire Porsche 911 GT3 RSR, triggering a chain reaction that also collected Olivier Beretta in the No. 62 Risi Competizione Ferrari 458 Italia, Bryce Miller in the No. 48 Chopard Watches/Total Lubricants/Motegi Racing Wheels Porsche and Kuno Wittmer in the No. 93 Pennzoil Ultra SRT Viper, blocking the track. Only Wittmer was able to continue. The next ALMS event will be at Circuit of The Americas in Austin, Texas on Saturday, Sept. 21. Visit ALMS.com for current and future event information including tickets and area accommodations. Follow the ALMS on Twitter (#ALMS, #MontereyALMS), Facebook and the official YouTube channel. Results from Saturday’s Grand Prix of Baltimore with overall finishing position, starting position (in parentheses), drivers, car number-class (in parentheses), type of car and laps completed.